Christian groups that believe in a Bible worldview are now being slandered with lies and falsehoods. CNN, MSNBC, CBS, ABC, NBC and more media are unethically telling viewers that solid groups like Family Research Council are “hate” groups. Now they are doing it to the Pacific Justice Institute. Because the progressive media, which hates, distorts and likes nothing better than to bash Christians and conservatives, and their causes, are wrongly using the radical progressive Southern Poverty Law Center’s phony “hate group” list as a legitimate source. If you speak out against a progressive agenda, you are considered a “hate” group. If you’re pro-life, promote biblical values, including traditional marriage, you get on the SPCL “hate” list. If you’re the Christian legal aid group, Alliance Defending Freedom, you get on their “hate” list. 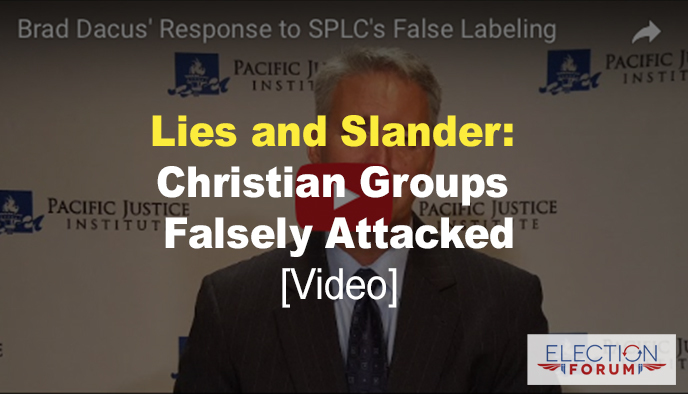 Meanwhile the SPLC is a “hate group” itself, hating any group that doesn’t abide by its anti-biblical ideology. Its most recent financial coup is a $1 million donation from Apple and another $1 million from George and Amal Clooney. Did you know the SPLC has a bank account in the Cayman Islands? Which begs the question, why does a tax-exempt group need such an account? The SPLC isn’t required by the IRS to disclose details about its foreign account. Just know they claim to be worth $319 million. They also spend twice as much on fundraising than they do on legal services for victims of legitimate civil rights abuses. And when it comes to accountability and ethics in fundraising, the SPLC is rated “poor” by Charity Navigator. Its founder, Morris Dees, has been labeled a “millionaire huckster,” by none other than the far-left Nation magazine. Even the FBI deleted the SPLC from its website’s list of legitimate resources on hate crimes. As of 2015, Dees was pulling in an annual salary of $337,000. The Southern Poverty Law Center has devolved from an organization that once combatted real hate groups such as the KKK, to attacking people like Ben Carson, Attorney General Jeff Sessions, and conservative author/speaker Dinesh D’Souza or legitimate groups like the Pacific Justice Institute. The Pacific Justice Institute (PJI) defends religious liberty, parental rights and other civil freedoms. It’s one of the most effective defenders and advocates of religious liberty. It defends Christians, churches and groups against hate and attacks on Constitutional rights. That means a group that defends religious liberties like the PJI is right up there with the KKK, Neo-Nazis and white nationalists. The SPLC also labels Tony Perkins’ Family Research Council as a hate group. The FRC says its mission is to advance faith, family and freedom in public policy and the culture from a Christian worldview. This labeling not only hurts a group and its leader’s reputation. It also can spark crazy violence. A liberal activist who shot up Perkins’ FRC offices told the FBI he picked his target from the SPLC’s website. The Pacific Justice Institute is demanding apologies and retractions from television and newspaper media outlets after being listed alongside extremist white supremacist groups linked to recent violence in Charlottesville, Va. According to PJI President and founder Brad Dacus, no reporters reached out to PJI to verify their stories. “The SPLC’s false accusation that PJI is a hate group is calculated to provoke contempt and potential violence against PJI. PJI has never promoted or engaged in acts of violence against any person or group. The work of PJI includes the defense of victims of intolerance against individuals and institutions because of their faith. The case files of PJI’s attorneys include the representation of immigrants fleeing religious persecution from Asia and the Middle East. “The SPLC is an extremist organization that creates vitriol and division instead of tolerance, dialogue, and understanding by attacking non-profit organizations like PJI for helping to defend those who cannot defend themselves. Further, in recent years, SPLC has created an enemies list which include nonviolent and law-abiding individuals and organizations who, as a matter of conscience, simply promote biblical values on sexual ethics. The media needs to stop undermining its credibility by quoting discredited, corrupt, biased groups like SPLC. Its sources should be credible, not taken as fact. CLICK HERE to visit the Pacific Justice Institute. I pray people will wake up to all the deceit being put out there from such groups like the SPLC, they are a special interest group spewing evil and have done so for a long time, I am very concern for Christians who are being so deceived in particular with everyone of those news channels mentioned!!!! GOD help us, really feels like the end times, maybe that would be good for how this world is becoming!!! I went onto Wikipedia and looked up Morris Dees, the founder of SPLC. He started out working for George Wallace! If THAT doesn’t tell you something, nothing will. He’s worked for various Democrats. Look it up, people. George Soros owns much of the media and he is an avowed atheist, so I see these attacks as satan’s last gasps going overboard. Spiritual warfare is essential though, then we as Christians must also demonstrate a show of force through writing articles, making calls and contacting editors of newspapers & stations wherever we can. This is what the left does, they keep at it.They are organized. Believers must do the same! If we would band together and each one take the time to specifically PRAY and THEN TAKE GOD DIRECTED ACTION it will make a difference. For wealthy Believers out there, please pray about supporting the operation of unbiased news or radio stations including several existing great internet news stations. PRAY for the Light of God to come, for hearts of owners and employees in the media to be changed. Let’s not give an inch more, but fight fire with the fire of the Holy Spirit and with our resources.